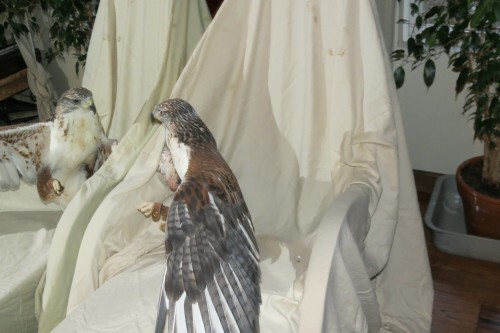 Through the Looking Glass /Hawks Aloft Inc.
I’ll never forget the morning when, as I sat studying outside in front of the large picture windows of my university’s library, a hummingbird collided violently with the large pane of glass. I watched the bird, which seemed so weightless in flight, fall heavily to the cement sidewalk. I was almost equally stunned. Several moments passed and the bird rose, shook itself, and flew off again. 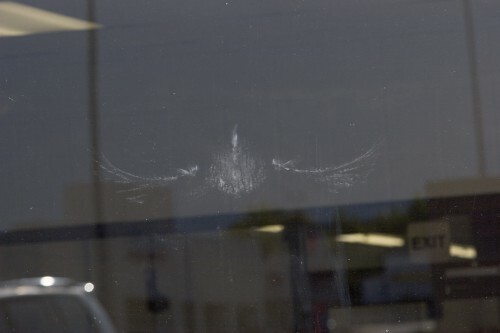 This is the best case scenario for a bird involved in a collision with glass; most are not so lucky. Ornithologists at Cornell University estimate that one million birds are killed each year as a result of run-ins with glass windows. Some researchers put that number closer to one billion. 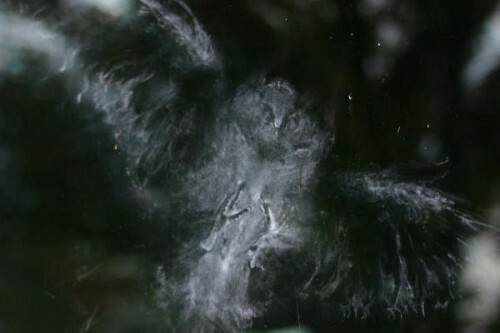 According to the American Bird Conservancy, each household in the United States kills two birds every year, simply by having windows that aren’t adapted to the avian life around them. What’s worse, these fatal collisions are most likely to happen at home sites that have active feeders, since they attract more birds to begin with. Birds aren’t cued in to the architectural elements that help us recognize windows, instead they see the reflection of the world around them or look through the window to another window on the opposite side of the house and see a gap to fly through, connecting them to more of their habitat. Frequently, during mating season, particularly territorial species may exhaust themselves bickering with their own reflections in windows, leading to exhaustion. For bird-lovers cognizant of the risks that windows pose, there are several options that can make your home more accommodating to the wildlife around you. Research has shown that birds generally avoid flying through vertical lines four inches apart or less and horizontal lines two inches apart or less, so there are innumerable ways to break up a wide pane of glass and communicate the barrier to your backyard bird friends; surely one will appeal to you and suit the design of your home. One simple and aesthetically pleasing DIY solution is incorporating paracord, also known as parachute cord, outside of your window. Sometimes called zen wind curtains, these heavy cords are hung several inches apart near the top of the window and weighted with knots at the bottom. The dark colored cords break up the windows sufficiently and achieve an estimated 90 to 100 percent reduction in bird glass collisions, and are pretty attractive to boot. There also are several different varieties of adhesive tape that can be applied in patterns to windows that obscure the clarity of the window just enough to deter birds without compromising the striking New Mexican sunshine that filters through. These options include American Bird Conservancy developed Bird Tape, durable enough to last up to four years; bird-safety films that can be applied in striped patterns or as a solid coat over glass—these have added benefits of reducing heating and cooling costs and providing greater insulation in your home; and there is also adhesive dots that can be applied in a “frit pattern” that is pleasing to the eye while simultaneously protecting birds. Other helpful and easy fixes include relocating feeders farther from troublesome windows, hanging lightweight, reflective objects (i.e., all those old CD’s that have practically become obsolete), or even attaching branches on the exterior of your home that obscure windows and slow down birds as they approach. Glass collisions impact migratory and backyard bird populations to an undue degree, including a number of threatened species. Because collisions are just as likely to injure or kill a healthy, breeding bird as a less robust individual, their impact on bird populations is even more worrisome. Simply considering the design of your windows and the ways in which you can make them more bird-safe can provide a boon to your local bird population. For more information on products that can be applied to your home, check out the American Bird Conservancy’s bird-smart glass product tests and suggestions.